Backdrop: The Backdrop Club, a group of students who participate regularly in theatre, music, and dance, each year sponsors an original or well-known production. Backdrop allows interested students to combine their musical and theatrical talents. Recent productions include Zorba, Marat Sade, and Cabaret, in addition to several original plays by students at the College. Backdrop auditions and plays are held in the spring. What could pledging a fraternity or sorority and seeing a play have in common? 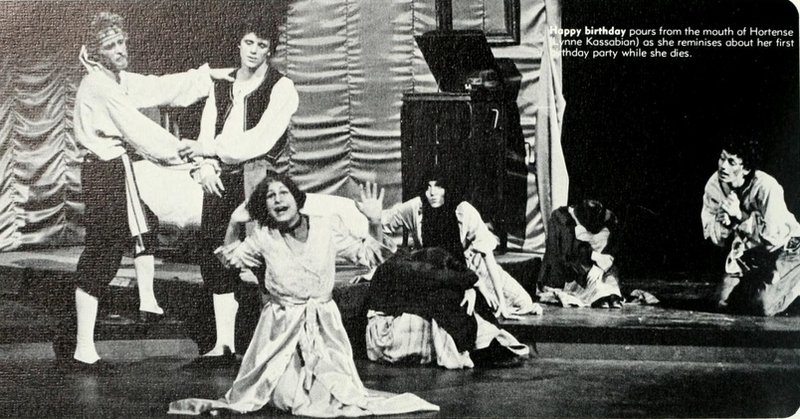 If the play had been Backdrop Club's presentation of Zorba in both cases one would have gone Greek. It seemed though, that many more people pledged, most of the nights Phi Beta Kappa Hall looked fairly empty, though this in no way reflected on the production in general. Perhaps problems did come up, not due to the excellent job of acting, but because of the play's length. Long productions such as Zorba or last year's Beggar's Opera tended to leave a more negative impression on some people's minds. One student who had acted in both Premiere and Directors' Workshop said, "Even though Zorba was a dynamic, alive play, it couldn't keep you from falling asleep," but at the same time maintained as many others did that there were some outstanding acting jobs. 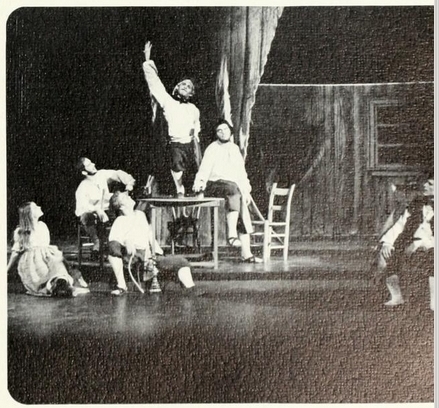 A mood play, Zorba presented the lustful, earthy lives of Grecian peasants who lived each moment as though it were their last. Special lighting effects, colorful sets, and lewd humor added to the impression the actors gave, varying from grief to rapture. Harvey Creadle as Zorba certainly executed his part well, at all times convincing and moving. One of the most difficult roles went to Lynne Kassabian as Hortense, the aging French prostitute who handled her task masterfully. Other notable characters included the Widow, Judy Webb who sang many numbers beautifully and Susan Blakeslee who as the leader of the chorus played a roll as narrator and introducer. Why didn't Zorba come off for some? Everyone agreed the acting was excellent, the lighting, sets, and costumes only added to the production, but perhaps these didn't come together well. Zorba was not a bad play by any means, it was not outstanding but definitely good.